Prominent & Leading Exporter from New Delhi, we offer colored microwavable lunch pack, microwave lunch box, microwavable three tier lunch box, air tight microwaveable containers, microwavable stainless steel container and microwavable lunch pack. King International's Colored Microwavable Lunch Pack is a combination of attractive design, style and durability. Its thermally insulated bag keeps your food fresh and warm for a longer duration. 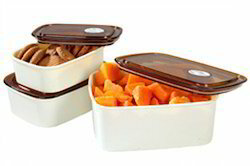 It comes with attractive spacious three containers which can hold variety of food items. Simply an outdoor friend for everyone who wants to Carry their lunch with them. It comes with a wide mouth serving all your multipurpose needs. 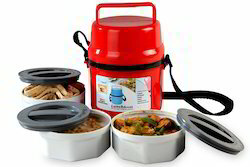 Microwave Lunch Box is a unique combination of style and utility.Always ready for party with your big and complete meal any time in microwave friendly food jar. It ensures healthy, fresh and warm meals. Ideal for everyone to enjoy maximum food flavours of season. It is insulated for superior temperature retention. Keep food hot upto 6 hours. 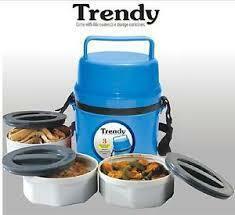 Microwavable Three Tier Lunch Box are spaciously designed with the blend of style and utility. Always carry your delicious homemade food with you in highly durable and insulated food jars which Keeps your food as just cooked, healthy and warm. A complete solution for your healthy day. King International's Microwavable Stainless Steel Container is a combination of attractive design, style and durability. Its thermally insulated covering keeps your food fresh and warm for a longer duration. Simply an outdoor friend for everyone who wants to Carry their lunch with them. It comes with a wide mouth serving all your multipurpose needs. 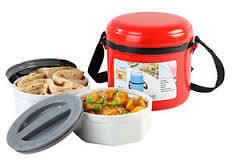 King International's Microwavable Lunch Pack is a combination of attractive design, style and durability. Its thermally insulated bag keeps your food fresh and warm for a longer durations. Simply an outdoor friend for everyone who wants to carry their lunch with them. It comes with a wide mouth serving all your multipurpose needs. This Microwavable Lunch Box is a unique combination of style and utility. Microwave friendly food jar to quickly re -heat your food. It keeps your food fresh, tasty and nutritious. Ideal for home and offices. King international's Microwavable Lunch Box contains small and portable food jars which are especially design for small lunch breaks. It ensures fresh, nutritious and warm food for your loved ones. It is insulated for superior temperature retention. 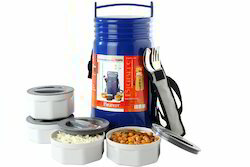 The containers are specially designed with a wide mouth to serve all your multipurpose needs.